My prototypes! My poor prototypes! 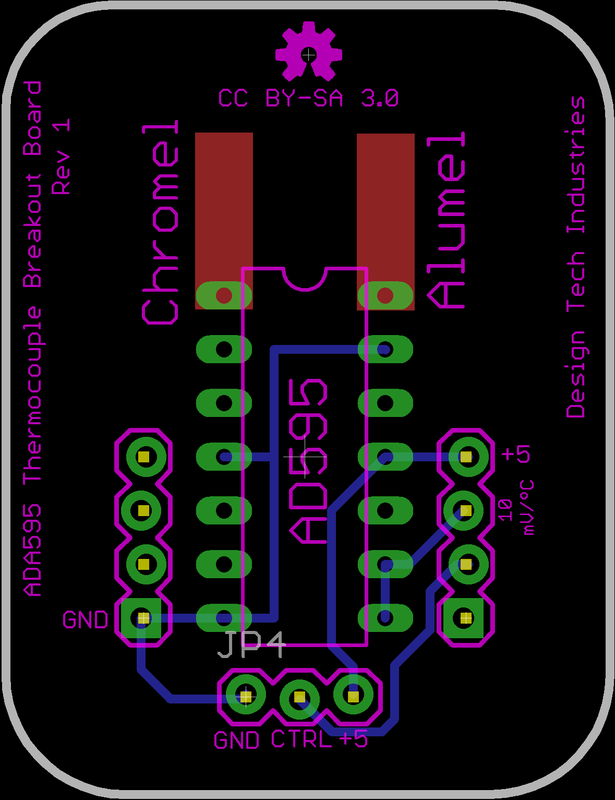 As you may know (if you follow me on Twitter, say), I had placed orders with BatchPCB, for my ATtiny 45/85 Programming Shield, and with the DorkbotPDX PCB order service, for prototypes of my ATtiny 45/85 dev board and AD595 breakout board, in recent weeks (they were actually my first times ordering PCB's from any service and are in fact my first ever prototypes). There have been two malfunctions of sorts with the 5th & 12th of December order runs, stemming from the fab house and UPS. Laen has been super and my experience is still awesome, and I will certainly use the service again if my boards are as expected, so my experience isn't that tainted =)..... And as a little side note, when you use DorkbotPDX for PCB runs you get three boards. If they turn out to work I'll be giving away one of the development boards and an AD595 breakout board to someone out there (this probably won't work out, last time I tried to give something away no one heard me). I understand why I don't have my boards in my hot little hands but it's just that I don't have any work to do at the moment and no TAFE work to keep me busy, no girlfriend and the majority of my friends are a long ways away so I had been hoping to be fiddling with gadgetry into the new year, which I guess I will be but just further into the new year than I had hoped... Oh well, Happy New Year! Don't get too drunk! Until recently I used Windows 7 exclusively for everything... Everything except microcontroller fiddlery which I delegated to a Linux box running Ubuntu (This setup was preferable because Linux is awesome and Windows is a necessary evil, nuff said). That is until I bought a lovely 27-inch iMac on a whim and moved completely to the platform, including my µC IDE's. I wasn't entirely sure if there were IDE's for the controllers I wanted to use made for the Mac and OSX, but found that the list of compatibility included the Arduino, PICAXE, and Parallax Propeller which all have either official Mac ports or officially recognised suits (in the case of the Propeller). Now it's as easy as firing up the suit I want, plugging the board in and starting to mess around with my favourite microcontrollers (That is of course not including the MSP430 line, unfortunately) on my favourite commercial computer! I've got an RFID car security immobiliser based on a PIC in the pipeline, and am wanting to learn more about the Propeller so expect to see them here in the new year! If you look at the top of this blog you'll see a list of three pages. The first is for my CNC mill and corresponding controller, the ArduFrauenfelderCNC, which I have been refining in both the controller and the physical mill (which I'm design in SketchUp in 3D), the next is an Arduino shield for programming the ATtiny 45 and 85 microcontrollers (they're somewhat compatible with the Arduino IDE meaning they're pretty darn easy to code) and the third is for an ATtiny 45/85 development board and it's accompanying breakout boards. They're all ATtiny related, except for the CNC controller, because ever since reading High-Low Tech's articles on programming these little chips using the Arduino platform (http://hlt.media.mit.edu/?p=1229 http://hlt.media.mit.edu/?p=1695) and seeing Pleasant Hardware's Toaster Over reflow controller (http://pleasantsoftware.com/developer/3d/reflow), which uses an ATtiny as the brains, I've been infatuated with the tiny things. The reason for this outburst of stuff? I'm currently studying Library Sciences through TAFE as an external student and they close between the end of October and only reopen in February the next year meaning I have a fair amount of time on my hands, which I've been putting into designing things I've been putting off. 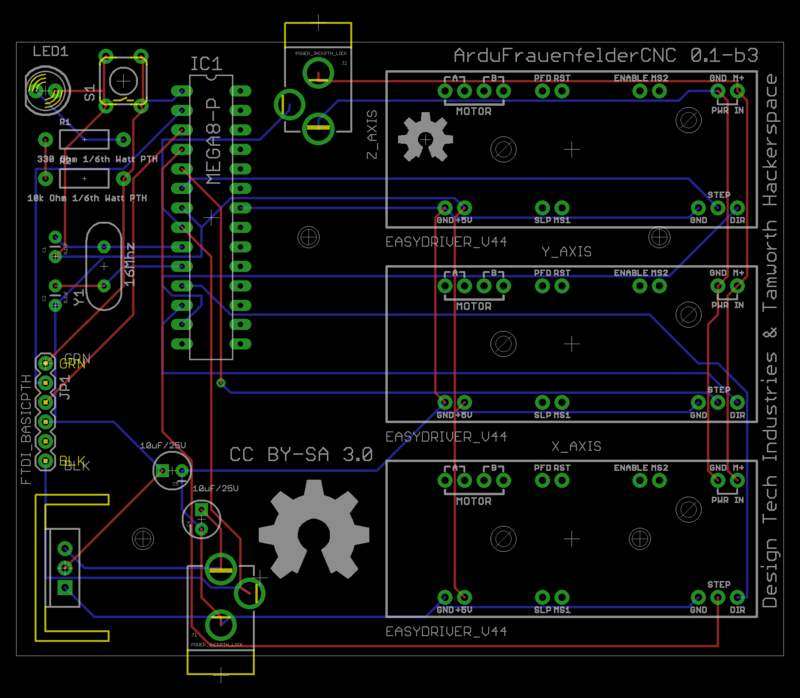 I'm currently in the process of refining all the boards I've published on my GitHub account. In fact I'm having the programmer shield made by BatchPCB and am hopefully getting the development board and thermocouple breakout board made through the DorkbotPDX PCB service (NOTE: I've now paid for the two boards to be made by the DorkbotPDX service and am on the December 5th run! Can't wait to get my hands on those little purple prototypes XD). 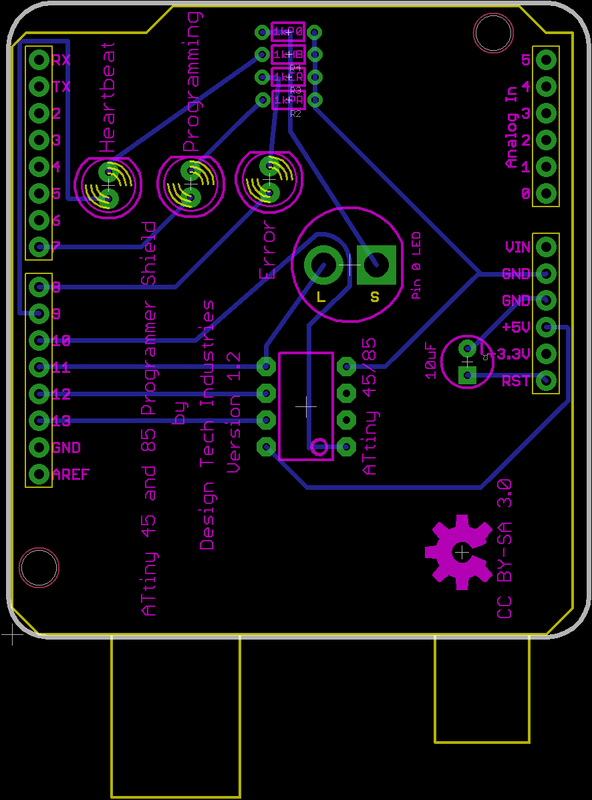 Once I get my prototype boards from BatchPCB and DorkbotPDX I'll construct them and publish it here (and hopefully finally use my four year old instructables account) with construction steps and videos of the board and what they can do, hopefully - fingers crossed. 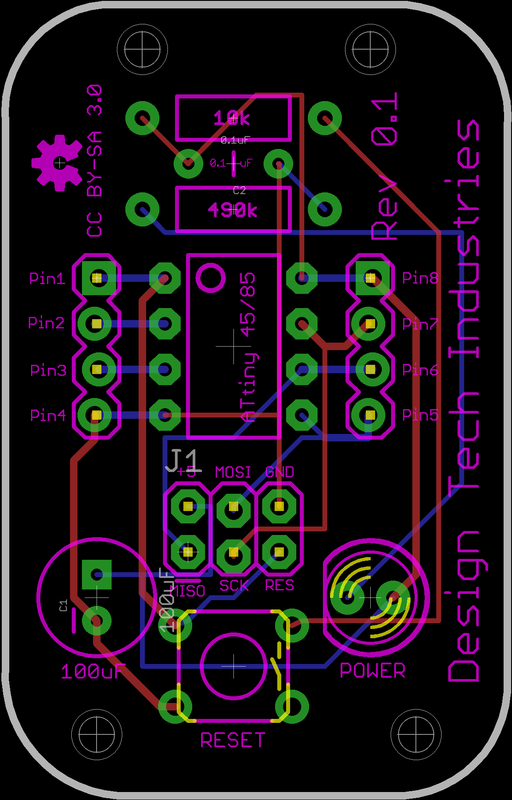 I've also designed a development board for the ATtiny 44/84 as it has a few extra pins, just incase the 45/85's 8-pins aren't enough. I really only needed to swap out the ATtiny45/85 for its larger brother. 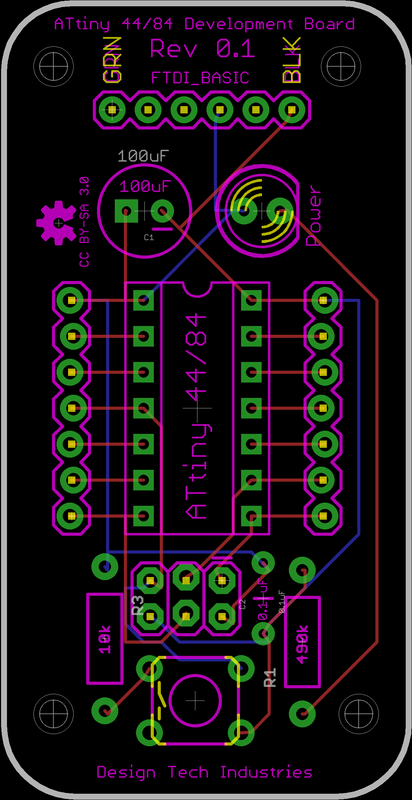 There's also an Arduino-based ATtiny44/84 and 45/85 programmer in the works, where the ATMega328 is running the ArduinoISP sketch and is solely used to program the ATtiny chips, meaning you have to use an ISP header and programmer if you want to program it outside of the Arduino IDE (it's probably not that useful, but I have time on my hands I'm not using doing anything else so what the hell!). 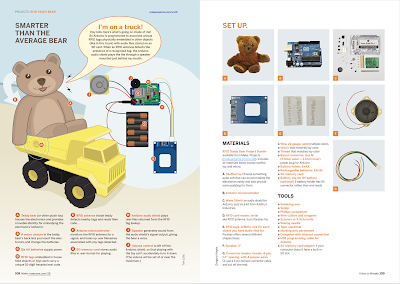 I'm also currently trying to put together a RFID location aware and talking/singing teddy bear for my lovely niece. 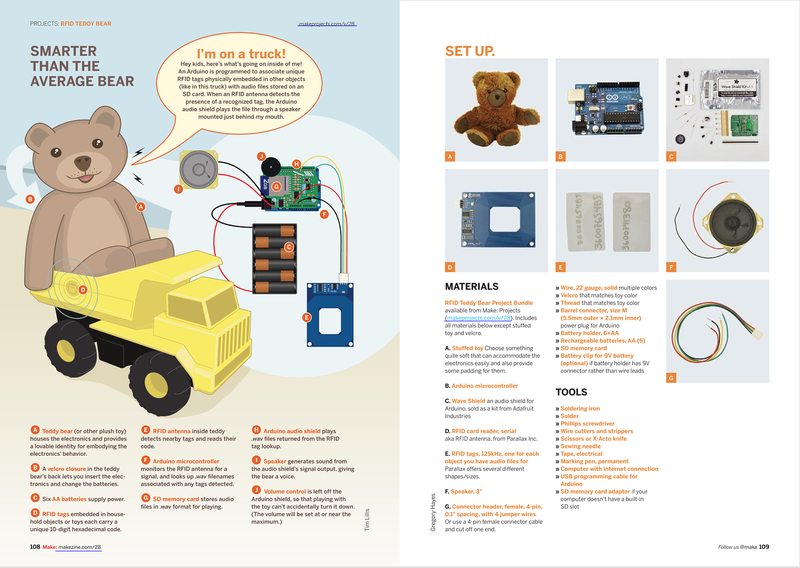 It's taken directly from the pages of the latest Make Magazine (Volume 28) which is about toys! And I'm finally contemplating entering my CNC mill in the intsrucables ShopBot competition, though I don't know I'll get it all finished by the cut off period (I thought a DIY CNC mill in a competition to win a professional CNC would be ironically funny xD). Anyway, that's what I've been up to, and will be up to, in the near future.